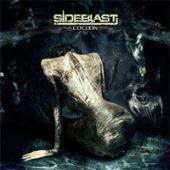 Second album by French black/death/thrash cyber outfit SIDEBLAST. They combine most genres into modern extreme metal. They´ve been at for seven years, can they last another seven? The title track opens with a short sample of radio sounds before turning into cyber thrash. Fredd´s voice is nothing but harsh, and at the same time quite modern. They expand their sound picture with keyboards and sampling, which increases the modern feeling. In typical French manner they are not over the top – but stay away from a lot of excesses like grinding and over-growling. Mix and mastering is fine, courtesy of the Wieslawski brothers (VADER, BEHEMOTH). The drumming is massive of sorts, but still comfy since I don´t perceive them as maximum trigged. The growl in “Barbarians” is in fine VADER class, and I enjoy the keyboard patterns. Noam´s guitar work is also nice, totally French apart from some loaned features of Zakk Wylde. But SIDEBLAST also has a symphonic touch, as can be the result when faint black tendencies are enforced by fuel from other genres. To me their finest moment on here is “Discordant Symphony”, which is very much in that vein. The info sounded a bit scary with grind and black being mentioned… But this is mostly death and thrash with some symphonic black infused.